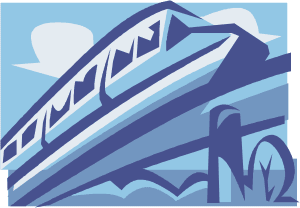 Monorails have been around since the late 19th century and today exist in the minds of millions as a novelty form of transit. Walt Disney World in Orlando, Florida, for example, operates a monorail system for their theme park, transporting passengers between parks and other areas in and around the park. Functionality of these systems goes beyond novelty however. Airports around the world use a monorail system to transport passengers between terminals, much quicker than using any other form of airport transit such as walking or moving walkways.